Asher’s name “sounds like the name of a dying thing,” declares his future love at their introduction. On the contrary, the title character of this novel is very much alive, though by story’s end he is intimately familiar with death. 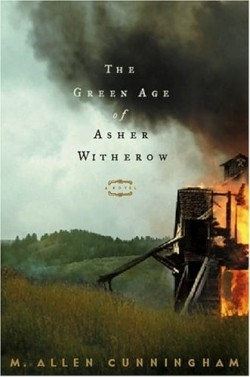 Asher’s green age (an allusion to the Dylan Thomas poem “The Force that Through the Green Fuse Drives the Flower”) spans the years from birth to thirteen, and, like the speaker the Thomas poem, he is never really green in anything but age. He speaks in full sentences at age one, begins work in a coalmine at seven, and reads Ovid and Emerson not long after. Although growing up fast is the norm in Nortonville, California, Asher is more advanced than his playmates. Perhaps the same can be said of the author, who at twenty-six has produced a remarkable first novel, a feat reminiscent of William Styron’s Lie Down in Darkness, likewise published in the author’s twenty-sixth year. Not only are the stories of both novels carefully designed, but every sentence in each one is crafted with care. Asher accepts this proclamation, already suspecting his alliance with the darker aspects of life: “Maybe I was built a little of blackness, a little of Nature’s bewitched side.” Although the older Asher may not completely understand the memories he relates, Cunningham’s control of the story is obvious. While the author directs his readers to more scholarly works for an accurate picture of 1860s and 1870s California life, his novel certainly offers a compelling look. Like the debut novel of Styron, now old enough to be Cunningham’s mentor, The Green Age should introduce this writer into the literary world even more concretely than his Pushcart Prize nominations for short fiction have already done.